Copyright not renewed i.e. it’s in the public domain now. *Gasp* an ankle! Quick toss a blanket over her before someone suffers a paroxysm! Copyright terms and the public domain. Searching Google’s online repository of pre-1978 copyright records. Searching the Copyright Office’s records from 1978-current (database of active copyrights). Bear in mind that just because someone’s selling a book does not mean that the book is still under copyright/ they own the copyright to the book. Everything in the public domain (i.e. no longer under copyright) can be printed and sold by anyone. Many companies currently sell print copies of expired copyright/ public domain books (just Google print-on-demand – these books are sold on sites like Abebooks, the Book Depository, and by independent suppliers). Modern Pattern Design by Harriet Pepin is one such book. It has been out of copyright for years- some publishers sell it as is, others add a couple of pages/ a chapter to ‘put the book in context’, copyright the annotated version and sell it. One of the publishers doing the latter is the Centre for Pattern Design (I have been in touch with them about their copyright on Pepin’s book and they only own the copyright on one such contextual version-which means if I come across a scanable version of the original I will scan it and make it available). I put up these posts because I feel this information should be made freely available to everyone that can make use of it. 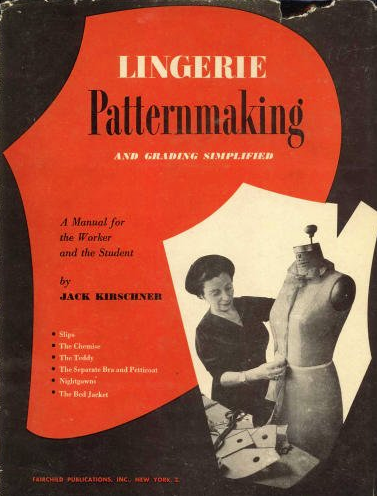 Modern sewing/ pattern-making books can be prohitively expensive and are generally not as thorough in their treatments of the same topics as their vintage/ antiquarian counterparts. I.e. books which are no longer covered by copyright. If you have proof that this is not the case (for example, documentation or images supporting current copyright details for this version) please do send me a link. I’ve listed the databases I use to check for copyright specifications. If you know of others I would appreciate links to those as well. *sigh* And now for some information about the book. It covers pattern making for Lingerie. From ye olde days (1950 is ye olde) so the styles and techniques used will be fairly different from those in vogue today (due to stylistic changes, technological advances and the availability of materials that only existed in Science Fiction back in the day). More free dressmaking sh*t here [seriously- Millinery and furs too. No I am not sorting it and picking goodies to feature. Some idiot suggested I should run around leaving comments linking all the Friday Freebies to all the blog posts out there mentioning said books. Because, obviously, I have nothing better to do. And Google hasn’t been invented yet. The only reason said idiot wasn’t rewarded with a swift kick to the head is because I don’t (yet) know where it lives]. Disclaimer: All non-self-generated images remain copyright of their original owners and are used here for purposes of illustration, humour and review. Image of lady in slip from Lingerie Parisienne by Juliette Morel. Featured image depicting measuring for dressmaking from Dress Selection and Design by Marion S. Hillhouse.